NEW BRITAIN - Unlike in other losses this season, there was no disbelief, no what-might-have-beens. The Central Connecticut State football team was spared from that Saturday. Instead, as the Blue Devils walked off the field, there were looks of disgust. A game that had been at multiple points within their grasp had slowly slipped away, the Northeast Conference lead with it. Yes, Saturday’s game was ultimately decided on the scoreboard by a missed field goal that would have sent CCSU and Sacred Heart into overtime and gave the Blue Devils a 28-25 loss. But there were too many issues to suggest the field goal was what cost the team in the end. As to what those issues where, well that remains the question. At times, it was hard to come up with a single answer on what needs to change or be fixed. A myriad of options were thrown out there by players and coaches: focus, discipline, missed assignments. There were lapses both on offense and on defense, particularly in the second half when CCSU (4-4, 2-1 NEC) was outscored 21-8 and the Pioneers (4-3, 2-0) were able to march up and down the field and prevent the Blue Devils from doing the same. CCSU started the day atop the NEC and had yet to lose to a conference opponent since the 2016 season (that’s eight games by the way). By the end of it, the Blue Devils lost their chance to take a strong hold of the NEC standings with three games left to play and will certainly need some help along the way if they are to come away with a share of the conference title. Things could change. Sacred Heart, who now owns any kind of tiebreaker against CCSU and is currently the only unbeaten team within NEC play, could lose two of its final four games - all conference ones. The Blue Devils team that showed up at the start of October just has to reemerge. Perhaps that was part of the issue in the second half when CCSU managed just 189 yards of total offense after finishing the first 30 minutes of play with 291 total yards and 17 points. Perhaps not. The Blue Devil’s lone score of the second half didn’t come until 5:25 left in the game when Jacob Dolegala connected with tight end Arthur Gilmore for both the 15-yard touchdown pass and the 2-point conversion. In the previous two weeks alone, CCSU put up a minimum of 48 points and 650 yards in each. Then there was the Blue Devils’ final drive of the game, which started at their own 17-yard line and had 2:36 left on the clock. It had come right after the defense had been able to make one of its few stops in the second half and forced a Scared Heart punt. And while CCSU managed to go 70 yards on 13 plays, one two went for more than 10 yards - both to Jean-Guillaume on swing passes out of the backfield. Defensively, there were too many breakdowns. The Pioneers took control of the game right from the start of the third quarter and engineered three consecutive scoring drives over the next 19 minutes and change. Their quarterback, Kevin Duke, completed 14-of-15 passes for 242 yards and two touchdowns after halftime and ran for another touchdown. As a team, Sacred Heart came away with 322 yards of offense over the last two quarters and faced just three 3rd-down situations. 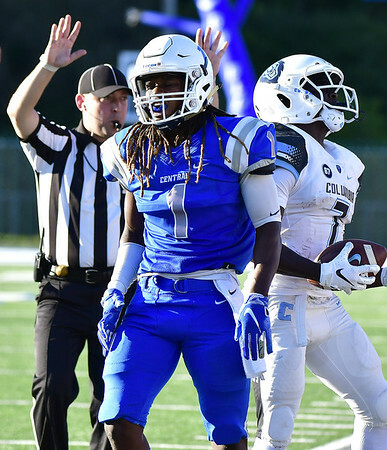 From the season so far, CCSU has shown it can be a good football team when it plays up to its capabilities on both sides of the ball - when it plays to its capabilities. All three remaining games are winnable. Wagner, St. Francis (Pa) and Duquesne have a combined record of 9-13 this season and are 3-4 in NEC play. It will just be a matter of which Blue Devils team decides to show up. Will it be the one that dismantled Bryant and won the shootout against Robert Morris by making key plays when needed? Or will it be the team that made too many miscues, even though it gave itself a chance to win on Saturday, to make a game closer than it needs to be? That will ultimately be the question. “We gotta watch a lot of film, stay focused, practice better and do a better job of doing what our coaches expect of us,” Exilhomme said. They’ll have three more weeks to see. Posted in Newington Town Crier, CCSU on Monday, 22 October 2018 21:27. Updated: Monday, 22 October 2018 21:30.